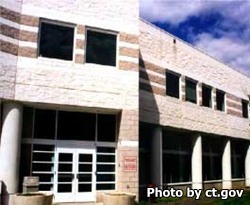 Corrigan Radgowski Correctional Center is located in Uncasville Connecticut. It is a level 3-4 facility that houses offenders of a mixed custody. This institution is home to over 1,650 inmates, about 400 of which are pre-trial offenders. This institution is separated into two buildings, Corrigan and Radgowski. Programs differ depending on which facility the inmate is incarcerated in. Corrigan has a focus on reducing violence in offenders and offers an anger management course. Offenders who have been classified as having a gang affiliation are segregated and closely monitored, as well as educated in the realities of being in a gang. Inmates in the Radgowski building may participate in a large amount of community based services working with the department of transportation, Troop E state police, and speaking about the impacts of prison on their own lives at various middle and high schools. You will need to have an approved visiting application on file prior to your visit. The visiting hours are divided up by both the building the inmate is in, and if the inmates ID number is even or odd. You can use this schedule of the current visiting hours for Corrigan-Radgowski Correctional Center.